Girard-Perregaux’s 1966 collection was first introduced in 2006 which until now has included only an automatic watch with date, and a complete calendar watch with moon phase indication and annual calendar. Now for release in 2010 Girard-Perregaux has developed an exciting and elegant new 1966 timepiece, the two-counter chronograph. 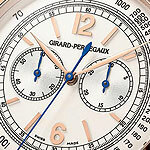 It is estimated that the price for the 1966 Chronograph will be in the $25,000 USD range. Featuring the 3030C0 column-wheel chronograph movement developed and produced completely by the Girard-Perregaux. The self-winding movement beats at a frequency of 28,800 vibrations per hour and is made up of 304-component. 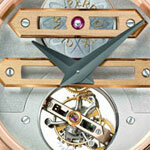 It has a centrally-mounted rotor made from 18 carat gold that winds the mainspring in a single direction of rotation. The movement allows for a 36-hour power reserve. The 1966 Chronograph features has a high polished 40 mm case which will be available in both 18 carat pink and white gold. The polished bezel surrounds a sapphire crystal that protects the dial. 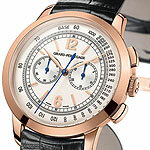 The pink gold model has a silver finished dial that displays the vintage style chronograph. The hour and minute hands are leaf shaped while the chronograph counter and central chronograph hands are crafted in blued steel. The case-back has another sapphire crystal window which reveals the stunning Girard-Perregaux manufacture caliber. The model is completed by a strap produced from alligator leather with a ardillon buckle in pink or white gold decorated with the Girard-Perregaux signature. The invention of the Tourbillon can be traced back to the beginning of the 19th century. It was invented with the aim of improving the precision of timepieces, which until then the accuracy had been limited by the irregularities caused by the effects of Earth’s gravity. Girard-Perregaux produced its first Tourbillon watch in 1867 which was first shown at the Paris Universal Exhibition. But when I think of Girard-Perregaux and Tourbillons all that comes to mind is the one-of-a-kind three bridge tourbillon whose patent dates all the way back to the year 1883, an invention that in many respects has yet to be outdone. 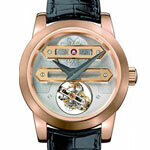 This year bring a new Tourbillon watch from Girard-Perregaux, the Bi-axial Tourbillon. This unique creation unites two concentric cages, which then allows the regulating part to perform multi-dimensional rotations. Perhaps most notably, this tourbillon compensates for the negative effects at multiple positions rather than just the vertical position. The Girard-Perregaux Bi-axial Tourbillon is comprised of 130 individual components. The tourbillon alone features 113 parts which weigh only 0.80 grams, it completes one full revolution in 3 minutes and 45 seconds. The mechanical with manual winding movement has a power reserve of 72 hours. It is beautifully displayed through both the dial and the case-back of the watch. The 18 carat pink gold case is 45 mm in diameter and 18.5 mm thick and has sapphire crystal protecting the the face and the back of the watch. The satin-finished silver dial is adorned with two beveled gold bridges, a window displaying the bi-axial tourbillon, and both hour and minute hands. An alligator strap and an 18 carat pink gold folding clasp complete the limited edition watch, which will number only 33 pieces. The Bi-axial Tourbillon is water resistant to 30 meters. 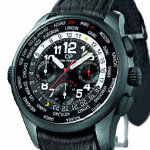 The Girard-Perregaux ww.tc Shadow has a look that is a little more casual than the previous World Time models. I think it is the black ceramic case that takes some of the elegance from the watch and transforms the watch into a more sporty look. This in my opinion is not a negative but a refreshing new look for the World Time collection. I think it is a very stylish chronograph watch that takes advantage of cutting-edge materials to achieve the new and pleasant look. The black ceramic case of the ww.tc Shadow is 43 mm and has a beautiful satin-finish with rubber coated crowns and push-buttons. The ceramic is lighter than steel but much harder, it is biocompatible and hypoallergenic. The case-back is made of tinted sapphire glass which reveals the sophisticated movement. The black dial has and white red accents and the rotating world time disc shows the cities of the world. The inner rotating indicator is half black and half white showing the day and the night times. The hands and hour markers are luminous for easy readability. The Girard-Perregaux ww.tc Shadow watch features a self-winding GP03387 caliber which has a flyback function and an adjustable date display with a power reserve of 46 hours. It comes on a black calfskin strap with a folding buckle. Water resistance is rated for 30 meters.